Suffolk County Crime Stoppers and Suffolk County Police Second Precinct Crime Section officers are seeking the public’s help to identify and locate the man who stole merchandise from a Huntington Station store in December. 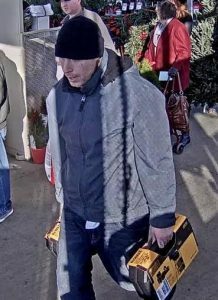 A man stole power tools from Home Depot, located at 785 New York Ave., on four separate occasions between December 10 and December 13. The total value of the merchandise was approximately $1,300. The man was described as white, 6 feet 2 inches tall and approximately 210 pounds. He had a tear drop tattoo below one of his eyes.